Value pack doubles as a clip organizer. Large assortment of clips plus pushpins comes in a hard plastic, reusable container with a flip-top lid and eight compartments. 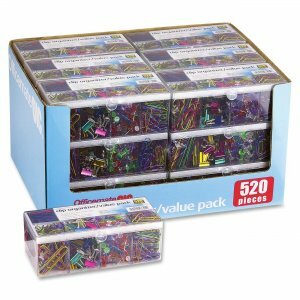 Clips include 70 giant, coated, metallic paper clips in assorted colors; 270 small, coated, metallic paper clips in assorted colors; 50 mini, metallic binder clips in assorted colors; and 130 transparent color pushpins.